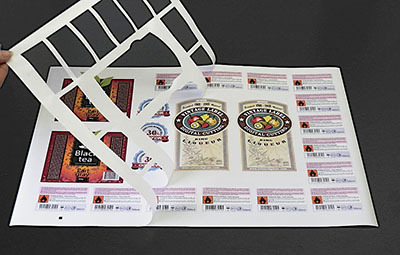 The i-Mark system allows contour cutting without operator on adhesive sheets and digital prints on cardboard, silk-screen prints and print shop materials. A mobile lever equipped with a vacuum suction cups lifts the sheets from the inbox tray and inserts them into the plotter. Depending on the thickness and rigidity of the sheets, the machine may insert from 40 to 120 sheets; while the machine is in operation, additional sheets may be added without having to stop the machine. The system is equipped with an internal vacuum compressor, which does not require external air connections. Proper alignment is achieved by crop mark reading for every sheet; a camera equipped with eye-mark technology performs crop mark reading adjustments in a few tenths of a second. Crop mark reading offsets grade and distortion which occur using digital printing systems; the precision grade achieved is approximately 0.2 mm. The sheet size that may be used ranges from the A4 format to 35 x 50 cm; the suction cups are positioned at a distance of 25 cm; for the A4 format, the sheet must be positioned on the long side. 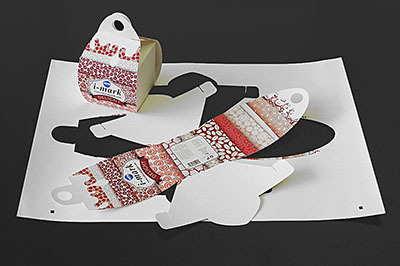 In addition to the half cut for adhesive sheets, heavy cutting may also be performed for all the applications which require that, such as labels, business cards, shaped business cards, small boxes and more; it successfully cuts cardboard with grammage ranging from 150 grams to 350 grams. Cutting is performed in hatching mode, which leaves continuity points on the material to avoid detachment during cutting operations; cutting parameters are set by the program. Speed varies depending on the complexity of the outline, on average it runs 30-40 seconds when cutting adhesives, while for through cutting the speed is much slower and therefore it is more apt for small jobs or simple cuts. The system comprises three separate components: inserter, cutting plotter and exit tray. These three parts are positioned one above the other and they must be positioned on a table, where the exit tray may be left hanging above the edge. The software manages the file in Adobe Illustrator format created both by Mac and Pc; it can also manage files created in CorelDraw. Copyright ATS © 2015. All Rights Reserved.